World class results every time, guaranteed. We absorb and understand your ideas and hand craft a rich response in sound and music. We’re affordable – particularly on our range of tailored package deals – we even consider pro-bono requests if you’re that good & we’re not too busy. Our recording studio and setting form a creative and inspiring backdrop ideal for recording, mixing and mastering your next musical masterpiece. Music production & audio, in all it’s forms has been Paul’s life’s work, and his passion, expertise and love is in every minute of every project undertaken. Paul is a respected educator who lectures his passion and has mentored many talented musicians, composers, producers and engineers. 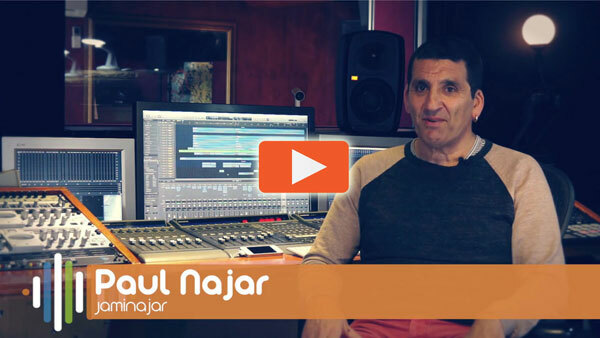 Jaminajar is the recording studios Sydney of renowned music producer, musician, composer, engineer and educator, Paul Najar. Located 30 minutes north of the Sydney CBD, perched high on the hill with ocean and lake views to the north and east and a short walk to the sands of Narrabeen Beach, it is one of the finest music production facilities and recording studios in Sydney. Consistant with our core values we believe in giving back to the industry that has given us so much which is why we are the major sponsor of the Northern Beaches premier youth band competition – Northern Composure. We also have a limited number of internships for our most promising students and we are very proud to announce our first specialised short course offering – Produce a Record Masterclass which provides unique “real world” training to a small group of learners and give one lucky band the opportunity to receive a world class recording produced, mixed and mastered for a fraction of the normal cost.